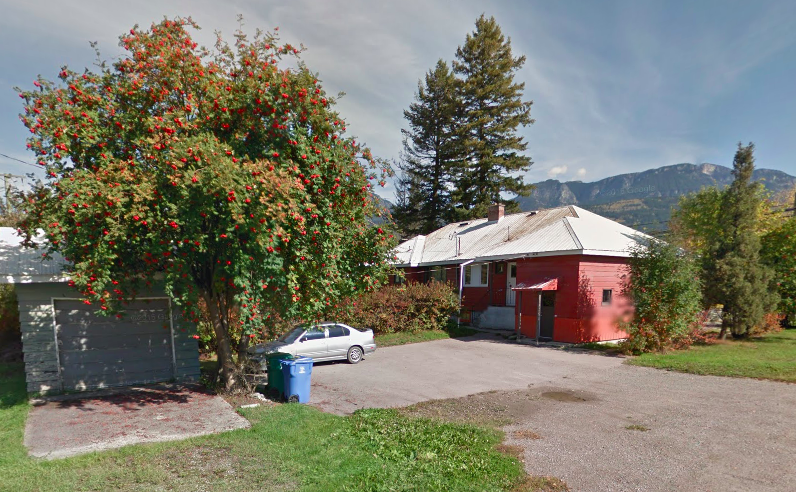 So it's been a busy couple of weeks since we placed an offer on the new home here in small town British Columbia. Given that it's actually the third house we have tried to buy, we didn't want to make a big deal out of it unless it was going to happen for real...and we're here, it's really happening. So, what was the final deal? It was listed for $289,000, and we settled at $279,000. We started our offer at $264k, they countered at $284k, then when went to $269k. Next they came to $281,500 and we countered at $273,000. They came back at $280, final. That was hard because we didn't want to go more then $275 - so our agent went back to them and asked if they would meet in the middle of our 'finals'. They came down another $1,000 and we took it. The $4,000 difference wasn't worth losing the house and only translated to a $13/month difference in the mortgage payment. The bank appraised the property before approving the mortgage and the value came in at $280,000 - so we felt really good about that and where we wound up. Oh? So what did that buy us? A three bedroom, 1.5 bathroom bungalow with both an attached single car and detached single car garage. The main floor has 1800 sq feet of living space, and the basement as another 1500. The lot size is the biggest we have seen in over a year of looking at 100 x 120 feet or .275 of an acre. It has the space we want for dogs, gardens and kids. Both the kitchen and main bathroom need renovating, but that's a post for another day. Here's another view of our *finger's crossed* next house. - Repair the chimney. It's no longer in use, but to prevent bricks from falling down we should address this. - There is a set of stairs that goes no where that we can remove. We think these concrete stairs were left behind from one of the previous renovations as it no longer goes to a door. - Fix the automatic door opener in garage. There is currently no power going to the outlet for some reason. - Attached garage man door needs a self closing devise to ensure no fumes get from the garage to the living areas. - The grading around the house is either flat or has sunken in in some spots, so we should build that help to prevent water from getting in around the foundation. There is also no gutter/downspout system which is apparently typical with tin roofs, but also something we could address to help manage water accumulation. - Ceiling has an r value of about 32 for insulation - we could increase this, but no rush. - There is no range exhaust it the kitchen, but we plan on renovating that anyways. - The bathroom fan blows into the attic, also a problem but we plan on renovating that room as well. - The dryer connections aren't on tightly so lint is blowing into the basement - easy fix. - The stairways to the basement have some variation in height that are no longer to code. - There are some old vinyl tiles that may or may not have asbestos which is common for this age of house. We'll have to manage that carefully when renovating. - The second electrical panel is mislabeled because of it's age - this could be addressed by an electrician for clarity. - Replace the smoke alarms as they expire every ten years - just to be safe. - Invetsigate plumbing as the pipe leaving the house is above ground for a foot or two which is a freezing hazard in the winter - though the current owners have never had a problem with it. - Some very minor cracking in the foundation could be investigated further but no immediate concerns. Phew! Ok, writing it all out makes it seem like a really big list, but it's really not. We felt really good about the inspector, and believe he did a thorough job. Now to build the 'want to fix list' ....there is a lot of paint in this houses future. Here's what might be our next house! The appraisal is in and it came back better then expected considering our experience with this appraiser on the last house. Our accepted offer on the house is $279,000 and the value came in at $280,000!! Woohoo! With all of the recent money changes, I thought it was time to do a net worth update. Our investments keep fluctuating and overall we're down a couple of thousand dollars there, but now that we don't have a mortgage payment (at least for a little while), we'll be able to make up some net worth ground with saving like mad. We also had a decent tax return due to being able to claim moving expenses. We've update our net worth charts accounting for the sale of the house, and we've also reduced the worth of our vehicles. I do include them in our net worth, because if the crap ever did hit the fan, we could sell one or both of them. This year I just used the online blue book value, but in the past we have had them assessed for trade in value as well. Our only debt is currently the Kia - it's a 0% interest loan, so we're not in a super big hurry to pay it off, though I do add extra chunks to payments every once in a while. Once we finalize the purchase of our next house and settle on a budget for some upgrades, we'll be prioritizing paying it off. Even though it's a 0% loan, it costs us $250/month in cash flow to have it. I haven't written about it a lot, but some of you may know that I've been making wine for a couple of years now. I took a bit of a hiatus while I was pregnant, but over the last month I've been getting back into the swing of things. I have two kits going - a Gewurztraminer and a Shiraz. The kits have everything I need in them except for bottles. Those wines take a little while to age to get good - so while they are doing there thing I'm starting a third batch. This quick drinker is called Dragon's Blood and is Danger Dave's of the winemaking talk forums evolution of Lon's Skeeter Pee. 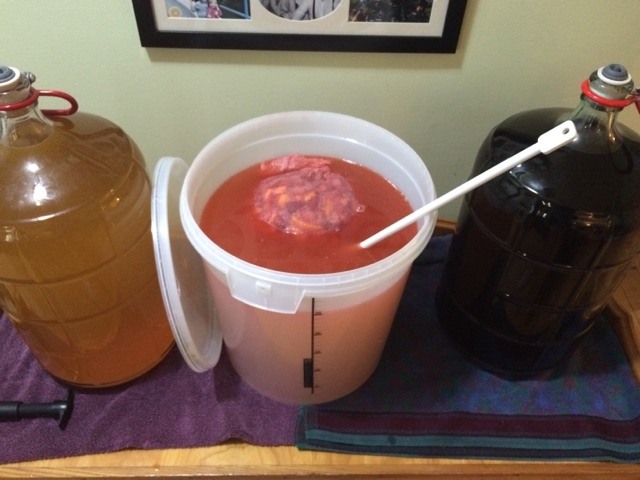 It's a fruit wine with a lemon back that is ready in 2-3 weeks start to finish. It peaks at three months old so making it now will mean it's ready just in time for summer! You'll find a link to the forum and original recipe above if you're interested in the original. I'm making a Tropical Coconut Variation. It's heavy on the strawberry and has mango and peach along with lime and coconut. You can see that the cost is under $3.50 a bottle!! If my town had a bulk store I could probably get it down to $2.50-$3.00 which is what the original blend cost me as frozen fruits the biggest expense second to the wine bottles themselves. 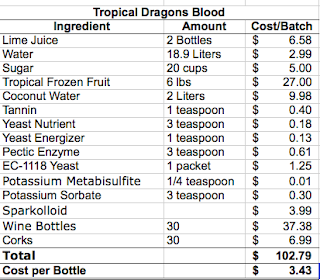 I've included the bottles here - but am working on a bottle collection, soon, even that will be eliminated from the cost breakdown. Including this fruit wine, I have about 90 bottles that I'm going to need, so it's probably time to take an inventory on that. We had a hiccup with Insurance already that's been worked through. The house is zoned for both commercial and residential. At first, the insurance office told us that if we had a total loss on the home we would have to rebuild a commercial enterprise. After reading the bylaws and a meeting with the town planner, we discovered that the Insurance office was not correct. We're going ahead with quotes from that, and the other office in town (there are only two). We have a big list of questions about the house to see about insurance - age of hot water tank, roof, etc. Hopefully the home owners can get some of that for us and we don't have to wait for the inspectors opinion for that piece. Next up is financing. We're pre-approved for the mortgage, but we're also after a renovation loan of about $25,000 for the kitchen and main bathroom. They need work! The kitchen is a series of four bargain basement Ikea sections with no upper cabinets in a tight Gally flow. The bathroom has a curtain for a cupboard under the sink. Last is the home inspection, which will run us about $900. There are no current inspectors in town, so part of this fee is travel to bring someone in from out of town. That is scheduled for about a week and a half from now - just days before we have to waive conditions (the 22nd). We're trying to not get our hopes up, and are anticipating some issues with the inspection - we just hope they don't find any deal breakers. It took some time, but I finally got our tax returns prepped and submitted. This year was a bit more complicated than others because we were able to make a claim for moving expenses. The tricky part though, is that Jordan moved for work in 2015, but the house didn't sell until 2016 - so we have to split the expenses across two tax years. I'm using TurboTax again this year, but needed to spend some time on the phone with the CRA before I felt comfortable going forward. I have a sizeable spreadsheet and a pile of receipts that document things as much as possible. Fingers crossed I did it correctly as I've read that moving expenses often prompt CRA to ask for more information or even to audit. We're looking at a refund of around $4,000! Woohoo! 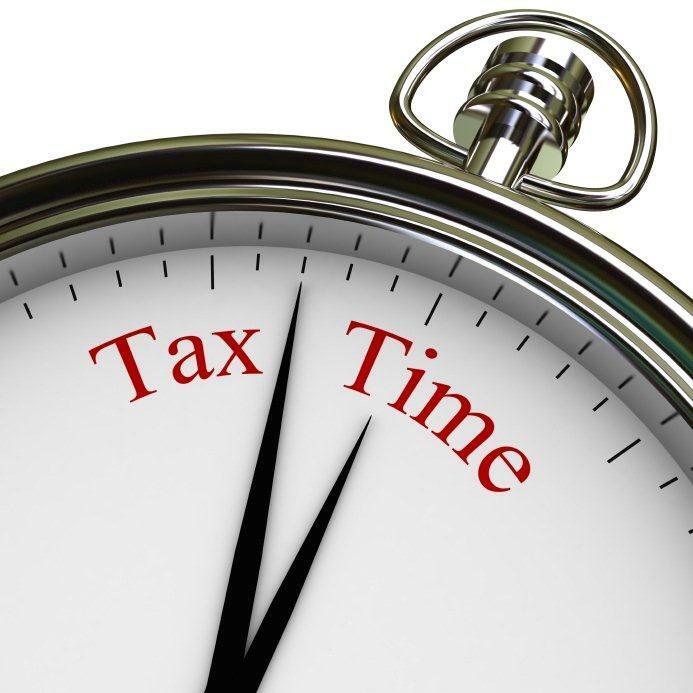 Do you have a refund coming your way? Have you already received it? We just put an offer in on a house in our new little town that was accepted after much back and forth. We now have three weeks to sort out conditions, cross your fingers for us. 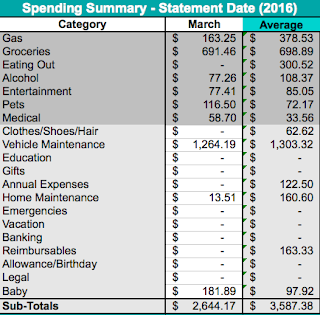 In all the years that I've been tracking our spending, this month has been our lowest spend. Incredible! 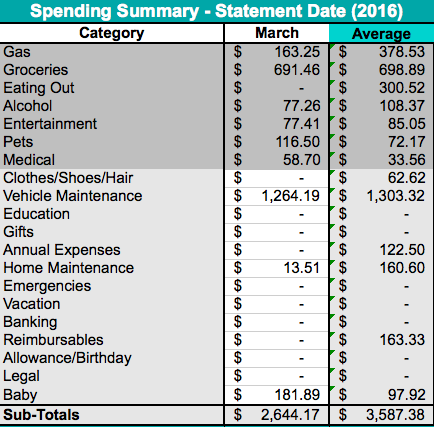 I've included our March spend, and the average for 2016 so far. You can see that not only did we spend nothing in eating out we spent very little comparably in gas as well. We spent pretty much the same on groceries as we usually do. I think a change for this past month though was that we were watching for sales as much as possible. The vehicle maintenance cost was from repairing our front bumper of the Escape which I had mentioned a few weeks or so ago about needed to do. Over Easter, my aunt was in town visiting and took our larger dog out for a walk. While she was out with him, another large dog ran from his backyard which had the gate left open, and charged our pup. There was quite a scuffle but after a few minutes, the other dog's owner came and pulled his dog away. Jordan and I weren't there, and I'm actually glad I wasn't with Little Man. Our pup seemed fine at first, but a day later we notice she was a bit lethargic and limping a bit. We combed over her and found that she had been bitten! Her hair is so long that we missed it at first. There is no vet in the town where we live, but I called the emergency line in the next town over and made a plan to drive her in the next morning first thing. 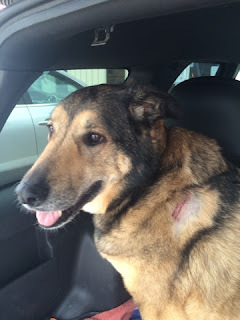 The vet shaved her shoulder, cleaned her wound, and gave me a week's worth of antibiotics. Here she is sitting in the back of the Escape waiting to go home. I felt so awful for her, but she's already feeling much better. One of the best things though, about that trip. Is when I went to pay ($115), I grabbed my credit card...and then paused. Then I pulled out my debit card. I didn't need to take money from our emergency fund, or use our credit card. That felt so good. That we had money in our day to day that I could use to take care of my dog without worrying about it one little bit. Our eating out ban was so super successful! We spend nothing, notta, zero, ziltch in restaurants in March! We have $800 left over in the day to day right now, and are feeling so good about how this went. So good in fact, that we have decided that while we won't say no if a friend or family member invites us out, we're going to continue on the ban if it's just the two of us.